Where’s the best place to hide a body? Page 2 of Google search results. A couple weeks ago, I attended a terrific event from 312digital that provided a quick filter and update on digital marketing — specifically SEO, content strategy, and social media marketing. A lot of territory was covered. Here are a handful of quick take-aways from three of the sessions, helpful tips on how we can help get your content on page 1 of Google search. Why you need to use Google Authorship. In addition to the great joke above, Andy shared info about Google Authorship. Something that is great to employ if you are developing “thought leadership” content, Google Authorship allows you to link the content you produce to your Google+ profile. The best part is: Once you have it set up, if someone searches for terms and your content ends up in the search results, the results will display your photo and info with a link to your Google+ profile. It makes your content stand out from the more standard listings, and is a great way to build your credibility — not only with your audience of colleagues and clients, but also with Google. Because the fact is, when we’re talking about search, we’re talking about Google. Check out Andy’s instructions on how to set up Google Authorship for yourself now. Let’s be clear about what SEO is. Sometimes people toss the term around so Carolyn started by being defining what SEO is. SEO is about making your message understandable to bots, so that your site performs better in organic search. SEO is not PPC. Google likes a good user experience. Things that make sense. Doing what works for your users and following best practices to optimize for SEO will make both humans and bots happier. Melinda can tell you that I’m crazy about hierarchy. Not organizational hierarchy, but typographic hierarchy, information hierarchy, and message hierarchy. It’s all about giving users entry points into and paths through content, creating clarity and priority, and supporting aesthetic goals too. HTML is also an exercise in hierarchy and — much like well-crafted information and typographic hierarchy helps humans move through content — proper HTML structure helps bots move through and make sense of the content in your web pages. A great reminder of why under-the-hood details matter. Don’t forget to optimize non-text elements to help bots find your messages and info. Fill in metadata for your PDFs and images. Also remember that the context of your web pages around the images (text or captions) also helps improve the experience, thus making Google happy. Banish the phrase “Click here” — please! Validation of one of my all-time pet peeves was nice to hear! 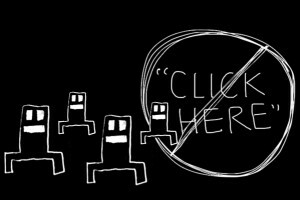 The phrase “click here” has a nails on the chalkboard effect for me. It isn’t specific (doesn’t tell the user where or what here is) and makes me feel like I’ve gone back in a time machine to an AOL interface from the 90s. (Help!) Details like that matter because they have a cumulative effect. And it’s simply bad for SEO. Please banish the phrase once and for all. The last two words of her presentation title are key. We’ve all been subjected to social media that seems to lack purpose! Your social media efforts should be driven by a clear strategy and integrate with other marketing and communication efforts. She had many, many other very specific tips. See her speak or teach sometime. We have lots of new and evolving tools to use, but the underlying communication tenets are age-old. Have a clear strategy, relevant positioning, meaningful messages, and airtight execution to support and strengthen your overall business, marketing and communication goals. Hope this information is useful. If there is any aspect of content strategy, SEO, social media, or other topics that you’d like more information about, let me know.